It all started many years ago ….. while practicing at a traditional veterinary clinic that promoted dry kibble diets, we began to notice a few pets who were never sick, had shiny coats and were bundles of energy. At the time we didn’t know better. We asked the pet owners what they were feeding and they answered – a Raw Diet. Overcome by curiosity, we began to research raw diets for pets. 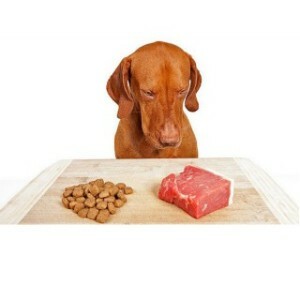 After finally getting over the fact that it is actually “raw meat” we started feeding raw diets to our own pets. Our dog that had a picky appetite was suddenly happy to eat the entire meal, our dog who always had a sensitive stomach suddenly had normal stools, and our cat’s urinary tract issues were suddenly resolved. Seeing how much our pets loved it and how much better they looked and felt, we were hooked! What is a Raw food diet? A Raw food diet is designed to mimic a dog or cat’s natural diet based upon their ancestral relatives. Dogs and cats have evolved to live on this diet over many hundreds of years. Their ancestral diet included the meat, bones, organs and intestinal contents of prey. Compared to a typical dog or cat food diet, the ancestral diet is considerably higher in protein and lower in fats and carbohydrates. Natural raw diets also contain about 80% moisture, while a processed dry food or kibble diet is only 3% moisture. This can cause major issues for many pets, especially cats. Although many pet food companies claim that you should “only feed your pet kibble” or they may develop a nutritional deficiency; we know that there are better options….. we like to compare dry kibble to ‘Total Cereal’ – it may have all the nutrients you need, but is it natural to eat this every day of your life? The many benefits of feeding a Raw Diet Feeding a raw diet has many benefits and resolves many common health issues. Among the benefits are a shinier coat, increased energy level, weight loss and resolution of allergy symptoms and inflammatory conditions. For dogs we see a decrease in skin and ear infections, improved digestion, a decrease in stomach upset and smaller and firmer stools. For cats we see a decrease in urinary tract issues, improved digestion resulting in a resolution of constipation and a decrease in skin infections. We are happy to feed raw diets to our own pets and can plainly see the increased health and vitality that they have. Recommendations for feeding the Raw Diet: If you are interested in the raw diet for your dog or cat you have a few options. We highly recommend the organic and human grade Raw Diets made by Primal. They offer many flavors and also have raw marrow bones, raw goat milk and raw freeze dried treats for pets. Additionally some of the Primal Raw foods are processed with HPP (high pressure processing) which eliminates the risk of bacteria such as salmonella, while maintaining the valuable nutrients present in the food. We carry the full line of Primal products, in our hospital; as well as Stella & Chewy’s and Rad Cat Please see our resources page for more information. If you opt to make the raw diet yourself we recommend doing some reading first. Recommended books include Switching to Raw, by Susan Johnson as well as Give Your Dog A Bone by Ian Billinghurst . These books will outline how and what to feed and ensure that your pet’s diet has variety, an adequate calcium level and added supplements. For cats we also recommend checking out the website CatInfo.org. We do recommended checking your pet’s blood levels when starting a raw diet & every 6 months thereafter to ensure that the diet contains adequate nutrients for your pet. If you have more questions on the raw diet for your pet please call us to schedule a food therapy consultation !